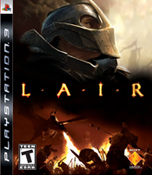 In a world ravaged by endless conflict and natural disaster, a call for peace turns into a bloodbath of betrayal and deceit in LairTM for the PLAYSTATION®3 (PS3TM) computer entertainment system. Playing as a warrior named Rohn who rides a voracious dragon trained for deadly aerial and ground combat, gamers must defeat the war-hungry Mokai to save the Asylian civilization. Together, Rohn and his dragon will attempt to change the destiny of a world on the brink of extinction by scorching, clawing and smashing through thousands of enemies and their war-trained beasts. •	Epic Storyline: With over 60 minutes of beautifully rendered cinematics and professional voice-overs, Lair weaves the tale of a heroic struggle in a world of savage beasts as civilization repels the onslaught of an unrelenting army. •	Incredible 1080p Graphics: With amazing 30-frames-per-second high-definition visuals, Lair is one of the first 1080p native resolution games, offering jaw-dropping, lifelike graphics. •	Intense Aerial and Ground Combat: Fierce ground and air warfare catapults players into epic fights against other dragons, beasts, warships and armies comprised of thousands of armored soldiers. •	Gigantic Creature Battles: Face off against enormous beasts of massive scale, including a huge sea serpent that measures over a mile long! •	Full SIXAXISTM Control: Supporting full tilt control and gesture recognition, the SIXAXISTM wireless controller allows for 180-degree turns, dives and attacks all through intuitive motion-based controls. •	Mission-based Gameplay: Smooth, seamless gameplay weaves missions and story tightly together and allows influence over the battles as a whole through destroying legions of soldiers, engaging ferocious 40-ton dragons, escorting supplies and demolishing armaments to save civilization. •	Upgrades, Medals, and Leaderboards: Gain abilities and upgrades rewarded for completing missions and for achieving medals based on performance. Then compare your statistics against other gamers via the online leaderboards and chat about how to get better scores on the online forums. •	True 7.1 Surround Sound: Uncompressed 7.1 surround sound immerses users into the game as they experience the cries of battle, the roar of dragons, the crackle of fire and flame, and the intensity of all-out war. •	Immersive Orchestral Score: Acclaimed feature-film composer John Debney (Sin City, The Passion of the Christ) drives the storyline and gameplay with a sweeping, emotive score. Registered users can 'subscribe' to this group and receive an email whenever a news article is added that contains the tag 'Lair'.